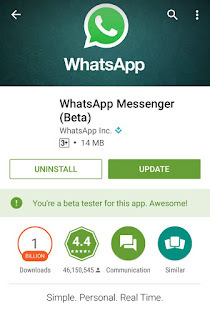 Simply head to the WhatsApp.com website, hit the download button, and then your respective smartphone operating system platform and a webpage will greet you to ask you if you want to join the Beta Testing Program. Once you register, you can simply check for updates to your WhatsApp on the app store on your smartphone. A new beta update will then start downloading and you will see WhatsApp updated to the latest version that no one must have installed before you. Best of all, we did see that WhatsApp servers had an older version than what we got as an update after joining the Beta Testing Program. However, you should know that the Beta Testing Program does not come free. No you don’t need to pay for it—you will be getting WhatsApp beta updates almost every day, indirectly eating into your data plan. So make sure you are aware that your data is being used for updates. Secondly, WhatsApp Beta Testing Program will also collect automatic feedback and send it to the developers on a timely basis so that they can develop the final release app better. So you will also be transmitting some amount of data back to WhatsApp on your part. You can always opt out of the Beta Testing Program whenever you want. Click here if you want to register to the program and stay ahead of others.